1. In a large bowl, mix the soap flakes and borax together. Slowly add the boiling water, stirring well, to thoroughly dissolve the dry ingredients. 2. Let cool, then whip into a foamy consistency with an egg beater. 3. Brush dry suds onto the furniture, concentrating on soiled areas. Quickly wipe them off with a damp sponge. You can get dishes spot-free in your automatic dishwasher without using chemical rinsing agents. • 1 to 1 ½ cups white vinegar Add the vinegar to the rinse compartment of your automatic dishwasher, being careful not to overfull. Wash dishes as usual. 1. Apply the toothpaste to the surface of the silver with an old soft-bristle toothbrush and gently scrub away the tarnish. 2. Rinse silver with warm water and dry immediately with a soft cloth. Sprinkle the insides with a small amount of powdered chamomile every day, brushing the powder out before wearing. Another trick is to fill a spare pair of socks with a mixture of coarsely crushed dried herbs and spices – any combination of rosemary, bay leaves, cinnamon sticks, whole cloves, orange peel, lemon peel, thyme, lavender, and pine needles. Tie the socks at the top and leave them in the shoes between wearing. For a gift, fill a new pair of socks with the mixture and tie with ribbons. Dissolve the brown sugar in the hot water and leave until it is lukewarm. Stir in the yeast, then immediately flush the mixture down the toilet. Tuck Lavender or southernwood sachets into clothing and linen drawers to repel moths and keep contents smelling clean and fresh. Put a drop of your favorite essential oil directly onto the wood in dresser drawers. The wood absorbs the oil and releases the scent gradually. Hang sachets of aromatic herbs from door handlers or in a sunny window. Pack a small decorative pillow with pine needles; put it among the sofa pillows to freshen the den. Place a porous pottery jar filled with essential oil near a sunny window. The heat will dissipate the oil, releasing the scent. Replace oil often. Simmer a blend of cloves, cinnamon sticks, and dried orange peel in 4 cups of water to give a warm spicy scent to your home on winter days. Top a light bulb with a drop or two of your favorite essential oil or scent. The heat from the bulb will release the aroma for hours. 1. In a saucepan, place the soap, washing soda, salt, and water and heat gently, stirring until soap, soda, and salt have dissolved. 2. Cool the mixture to lukewarm, then add the essential oil. Stir well and pour into a jar. 3. To use, pour two to three tablespoons of the mixture into half a bucket of hot water, stirring well. For large areas, you may need to double the amount. 4. After cleaning, rinse the floor with half a bucket of clean water into which you have poured a cup of white vinegar. 1. In a container, mix the ingredients well. 2. Wet the floor and walls of the oven (you can use a wet rag or paper towels) and generously sprinkle the mixture on the surface. Repeat and let sit overnight. 3. In the morning, wipe the mixture and the grease away, rinsing well to remove any filmy residue. 4. For stubborn, burned-on stains, scour with salt and an abrasive pad. 1. Flush the toilet to wet the sides of the bowl. 2. Sprinkle the borax around the toilet bowl, then drizzle with the vinegar. Leave for several hours before scrubbing with a toilet brush. Use crumpled newspaper instead of paper towels for lint-free results. • ¼ cup white vinegar • 1 tablespoon cornstarch • 2 cups warm water Mix the ingredients in a spray bottle and shake well to dissolve cornstarch. Spray liberally onto glass surface. Wipe dry with a clean cloth or newspapers, buffing to a streak-free shine. Stubborn stains need extra care. But that doesn’t mean you have to make a costly investment in store-bought products. Look no further than your household shelves for these stain stoppers. Blood, Chocolate, or Coffee Soak soiled articles overnight in a solution of ¼ cup borax and 2 cups cold water. Wash as usual the next day. Grease Apply a paste of cornstarch and water. Let dry, then brush away the powder and grease. Red Wine Sprinkle stain with salt; let sit for several hours. When dry, brush away salt and wash, or clean immediately with club soda or seltzer. Grass Soak stain in a 3 percent solution of hydrogen peroxide, then wash. Ink on a White Shirt Wet fabric with cold water and apply a paste of cream of tartar and lemon juice one hour before washing. Scorch Marks Rub area with a cut raw onion. After the onion juice has been absorbed, soak the stain in water for a few hours. Combine the ingredients and spray generously on moldy surfaces. Wipe clean with a damp sponge. 3 1/3 ounces calcium carbonate (from a pharmacy) • 1 ½ ounces baking soda • 1 teaspoon salt • about 7 tablespoons glycerin • 3 to 4 drops peppermint essential oil • 2 drops green food colouring (optional) You will need a small ceramic or glass bowl, a spoon, and a sterilized, wide mouthed 5-ounce glass jar with a tight-fitting lid. 1. Place the calcium carbonate, baking soda, and salt in the bowl. Stir in sufficient glycerin to make a thick paste. 2. Stir well and add the peppermint essential oil, drop by drop, until the paste is pleasantly flavored. Add the 2 drops of green food colouring at this stage if desired. 1. Wash the fabric in warm soapy water, then mix salt and lemon juice, enough to cover the mildewed area, and apply it. 2. Place the article in full sun, rinsing it after several hours. If the stain persists, repeat. Mix the oils together thoroughly and apply sparingly with a soft rag. Wipe dry with a clean, soft cloth, buffing to a gleaming finish. In a small bowl, mix the borax with enough soap to form a creamy paste. Add the lemon oil and blend well. Scoop a small amount of the mixture onto a sponge, wash the surface, and rinse well. 1. Crush the lavender flowers to release their scent. 2. Mix well with the baking soda and sprinkle liberally on carpets. 1. Fill the washing machine with water. 2. Add the baking soda and then the clothing. 3. During the final rinse cycle, add the vinegar (pour it into the softener dispenser, if your washing machine has one). Variations: You can also soften clothes by adding ½ cup baking soda during the wash cycle or simply use one part soap flakes and one part borax to wash the clothes, putting the mixture in the water in the washing machine before you add the clothes. 1. In a sauce pan, stir together the soap flakes, borax, and water. Heat gently and stir until the liquid is clean. Add the glycerin and cool to lukewarm. 2. Add the essential oil and stir thoroughly. 3. Pour into a wide mouthed jar or other container and cover until needed. Add a cupful to the washing machine, making sure that the soap is fully dissolved before adding any clothing. For best effect, sue this gel, with warm or hot water. 1. In a small bowl crush the soap flakes with the back of a spoon until powdered (or whirl them in a blender). Mix in the chalk or diatomaceous earth and the baking soda, braking up any lumps. 2. Sprinkle the essential oil over the surface of the powdered mixture and stir in with the spoon. Continue stirring for several minutes to disperse the oil throughout the mixture, then spoon the mixture into a screw-top jar or can that has had small holes punched in the lid. 3. Cover the holes in the lid with masking tape to keep the powder dry while it is stored. Let the mixture sit for a week before using so that the essential oil is thoroughly dispersed. Slow drains? Use this drain cleanser once a week to keep drains fresh and clog-free. Pour baking soda down the drain, then vinegar. Allow the mixture to foam for several minutes before flushing the drain with hot water. Keep your garbage disposal smelling fresh with this useful tip. Drop the lemon into the disposal and run the motor until the lemon is pulverized and washed down the drain. 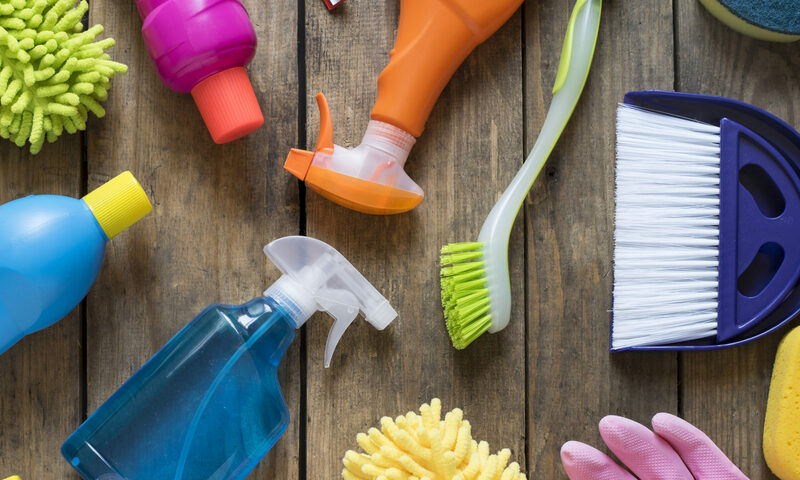 You don’t need expensive detergents to get dishes clean. Used with hot water, this liquid gel cleans dishes beautifully without creating unnecessary suds. Do not use in dishwashers. 1. In a bowl, combine the soap flakes and the water and stir until the flakes have dissolved. Cool to lukewarm. 3. To use, squirt two to three teaspoonfuls under running water into the sink. All you need to make your automobile’s chrome shine is a handful of aluminum foil and a little elbow grease. • aluminum foil To remove rust from chrome bumpers, simply wad up a piece of aluminum foil and rub it over the spot vigorously. This soap is gentle to the car but tough on grime. 1. Combine soap and water in a large pail. 2. Cleaning one section at a time, apply the solution with a large sponge, concentrating on heavily soiled areas. Rinse immediately before moving to a new section. 3. To avoid spotting, dry the car with a chamois or soft flannel cloth. Mix the ingredients well and apply with a sponge. Wipe the windows dry with absorbent towels or a soft flannel cloth. 2 cups borax • 2 cups washing soda Mix the borax and washing soda and store in a closed plastic container. To use, add 2 tablespoons to the dishwasher soap compartment. This paste is effective for most household cleaning chores and contains no harsh abrasives to harm surfaces. The paste resembles a gray putty, except that it is slightly softer and has a bubbled surface. The chalk or diatomaceous earth provides a fine sheen without scratching. You can find diatomaceous earth in garden, pool and hardware stores. Use store-bought brands of pure soap flakes, such as Ivory, or make your own by grating a bar of pure soap. 1. In a small bowl, crush the soap flakes into a powder with the back of a spoon (or whirl them in a blender if you wish). Thoroughly mix in the chalk or diatomaceous earth and the baking soda. 2. Stir in enough of the glycerin to form a thick paste. Spoon the mixture into a wide mouthed screw-top jar or other container. 3. Keep the paste covered when not in use, to prevent it from drying out. Commercial automotive waxes often contain petrochemicals. Try this natural alternative. Please note that turpentine is flammable and can be toxic if swallowed. Store away from heat sources and out of the reach of children. 1. Using a double boiler, melt the waxes together. 2. Remove from the heat and allow to cool slightly before stirring in the turpentine and the oils. 3. Pour into metal cans that have secure lids (old coffee cans with plastic lids work well). Cool, uncovered, to room temperature. When cool, close the cans securely. 4. To use, scoop a small amount of wax onto a soft cloth or rag. Using a circular motion, rub the wax into the car’s finish. Allow to sit for several minutes before buffing to a showroom shine. Variation Don’t throw those old cotton socks away! Save to use as a perfect waxing and buffing cloths – then discard. This spray is strong and needs to be applied judiciously. You want a room to have a hint of this spicy scent, not an overpowering perfume. You’ll find these essential oils at health-food or aromatherapy stores. 1. In a spray bottle, combine the alcohol and the essential oils and shake well to disperse the oils. Add the distilled water and shake for a minute or two more to thoroughly blend all the ingredients. 2. Let sit for at least a few days before using, to allow the fragrance to mature. A quick spritz is usually all that is needed to freshen a room. I really like your site. Really good content. Please keep posting such really good material. I’m sharing this with some friends of mine who I’m sure will love these remedies.